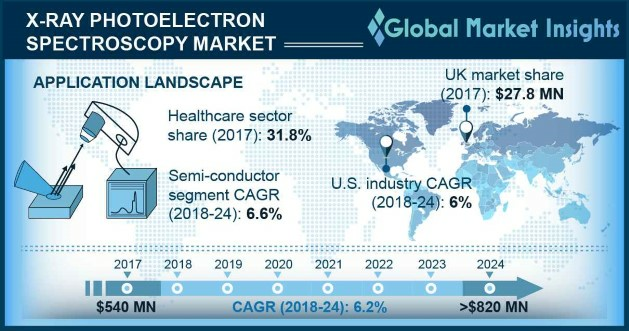 X-ray Photoelectron Spectroscopy Market size is set to exceed USD 820 million by 2024; according to a new research report by Global Market Insights. Growing demand for hyphenated technology will enable efficient characterization of surface elements that should increase its preference amongst the technicians and engineers. Moreover, scientists utilize this technology to manufacture commercially viable products. For instance, scientists typically select TGA 8000 hyphenated technology that helps them to manufacture superior quality polymer materials. Also, hyphenated technology has been leveraged by researchers for developing new compounds that are used in treatment of chronic diseases such as cancer. High usage of hyphenated technology in medical as well as various other emerging industrial fields such aerospace and automotive should augment the industry growth in forthcoming years. Germany X-ray photoelectron spectroscopy market accounted for 23.4% revenue share of the Europe market. XPS market growth can be associated to the increasing applications of XPS systems in manufacturing commercial products such as chemical compounds and glasses. Moreover, increasing application of x-ray photoelectron spectroscopy in medical industry will positively impact the market growth. For instance, XPS devices are currently, being extensively utilized in orthopedic treatments. Orthopedic treatments being more prevalent in geriatric population will elevate the industry growth.